Six years ago Friday, Heyleigh officially became my horse. Looking back on all those years I can't help but be amazed at how much we've been through together. When my family bought her, the main thing we were thinking about was signing the papers as quickly as we could so that her old owners (who were extremely neglectful and borderline abusive) couldn't change their minds about selling her to us. She was only barely rideable, was pretty skinny, and had probably only seen a farrier once or twice in her life. Now she's making incredible strides in her training, is perfectly healthy, and has routine vet and farrier care. No matter how upsetting things got in my life, I could always count on her to walk over to me from the pasture or stick her head out her stall door when I walk down the barn isle. She has such a talent for making people smile and feel loved. I can't even begin to convey how much that means to me sometimes. Something else that's pretty special about this little mare: she loves animals. If someone brings a cat near her, she'll reach over and pet it with her muzzle. She'll always lean down and sniff at dogs that come near her. She even helps new horses transition into the barn. Back at our Minnesota barn, new people at the barn would track me down because their horse was "completely in love" with Heyleigh. She'd be their best friend for a week or two until they settled in, then move on to the next newbie. 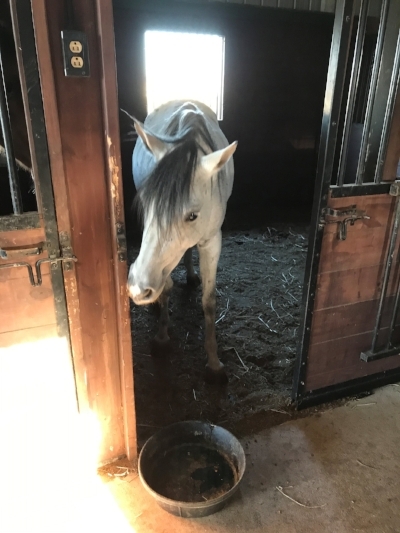 Things are a little different at the Indiana barn, but it's still a rare day that I can take her out of her stall or paddock without at least one horse running after her or making a racket as she leaves. Thank you for everything, Heyleigh. I hope to celebrate many more gotcha days with you, and just where life takes us.